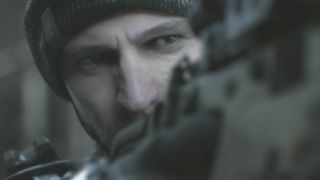 Ever since Ubisoft showed off footage of The Division for the first time, we’ve been waiting to see if the final game lives up to its initial visual target. It actually gets pretty darn close. The Division is a beautiful game, and in surprising ways. I didn’t expect a grey, decrepit city to give way to such eye candy, but The Division is easy to admire when a snow storm blows in during an intense firefight, or when the right grenade sets of a series of action movie explosions and sends debris—newspaper, plastic reindeer, dirt, glass, fire, bad guy pieces—every which way. It’s one of few games I’ve played that feels like a real city, and part of that is the sheer amount of meaningful clutter in the environments. Piles of garbage are rendered in sharp detail, they react to weight, and make sense as a prop. Refugee camps are packed with tiny set pieces that tell small stories. A makeshift table is set with plates and candles, as if the people that used to live here were reaching for the safety of their former lives. The amount of props that react to gunfire is nearly unprecedented in an open world game of this size. In one mission, giant Christmas ornaments dangle from the ceiling. My buddy and I spent a few minutes just shooting them to observe how they responded to different kind of gunfire. The Division is a massive, pretty physics playground and I’ve yet to tire of looking at it. Or taking cover to close car doors. I'd play a game exclusively about that. I’m still working on our review, but you can read my initial impressions in the meantime. Stay tuned for more on the Dark Zone, where to find the best loot, and more.